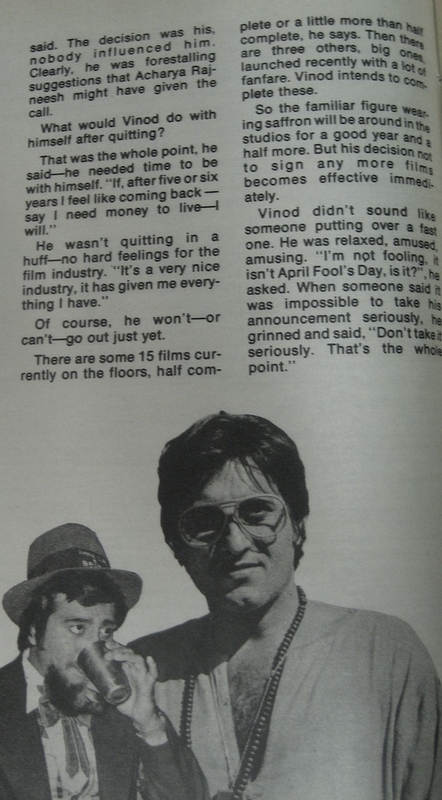 Sometimes it's impossible to know where to even begin with these 70s Filmfares, so amazing are they as artifacts from film culture of the past (and the ads alone are priceless). 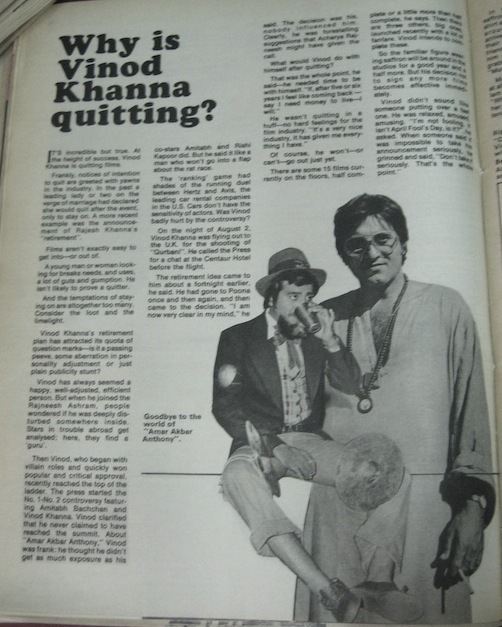 The issue of September 15, 1978, caught my eye for its short article on Vinod Khanna's announcement of leaving the film industry. 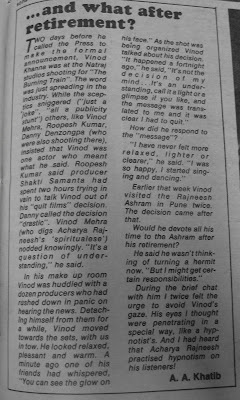 It's the first contemporary source I've seen that uses actual quotes from him, as well as a few from colleagues on The Burning Train, which he was filming at the time. This weird collage makes it look like he's holding a ventriloquist dummy of himself. 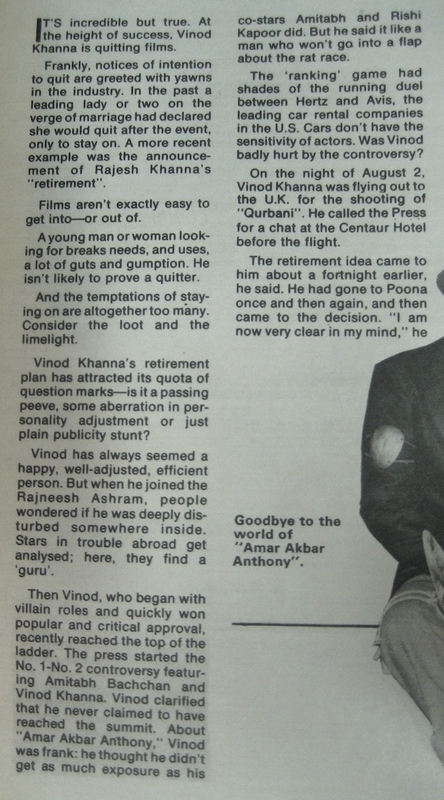 Voice-throwing aside, I'd love to see someone try to work a miniature of the one-man-band outfit from Amar Akbar Anthony! Click the images below for legible close-ups. It also had a little article on Vinod and Shashi Kapoor being signed and un-signed for Manoj Kumar's Kranti. 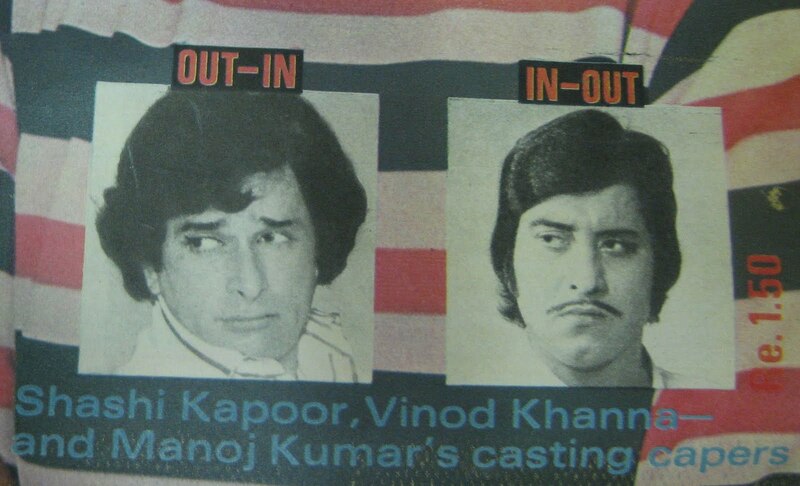 I haven't seen Kranti yet, but it's fascinating to imagine a role that could work equally, or even equitably, well performed by these two stars. Their skill sets seem so different. 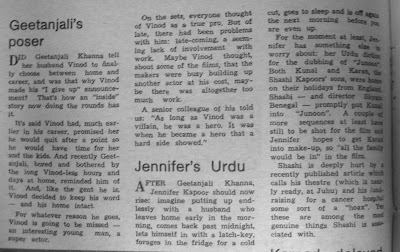 A set of blurbs about Geetanjali Khanna (containing the very useful phrase "bored and bothered by the long Vinod-less hours and days at home") and Jennifer Kendal (working on Urdu for Junoon). The latter piece also mentions Shashi doing fundraising for a cancer hospital, in addition for the future Prithvi Theater. Dil squish! 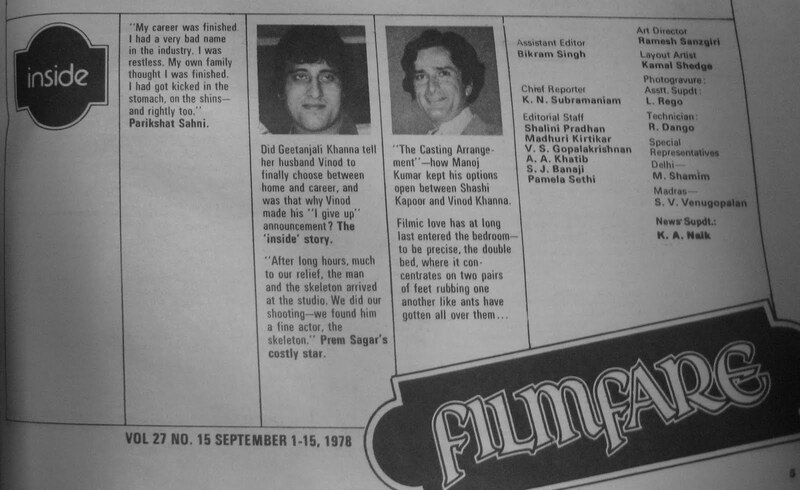 "What's Shooting" in September 1978? 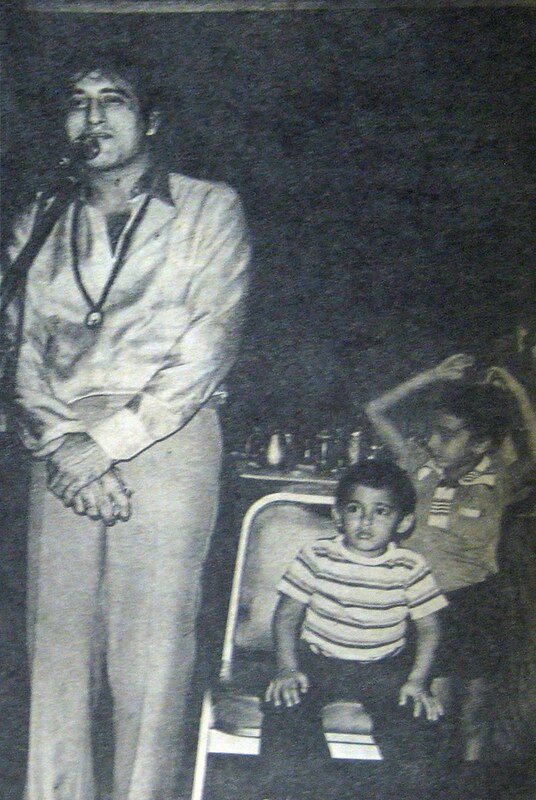 Dharmendra and Zeenat in C.I. 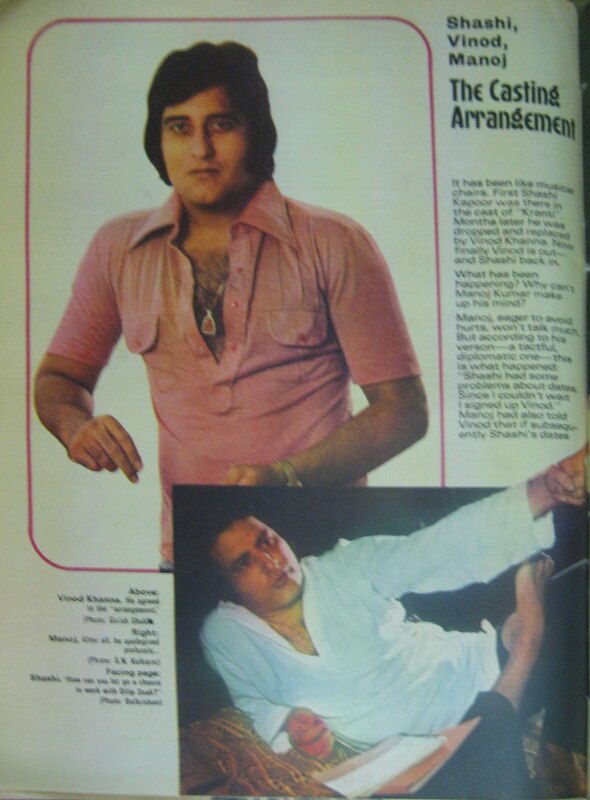 D.; Shashi and Bindu in Apna Khoon (see their fun qawwali here); Amitabh and Rekha in Mr. Natwralal; and Jeetenra and Neetu in Aatish. 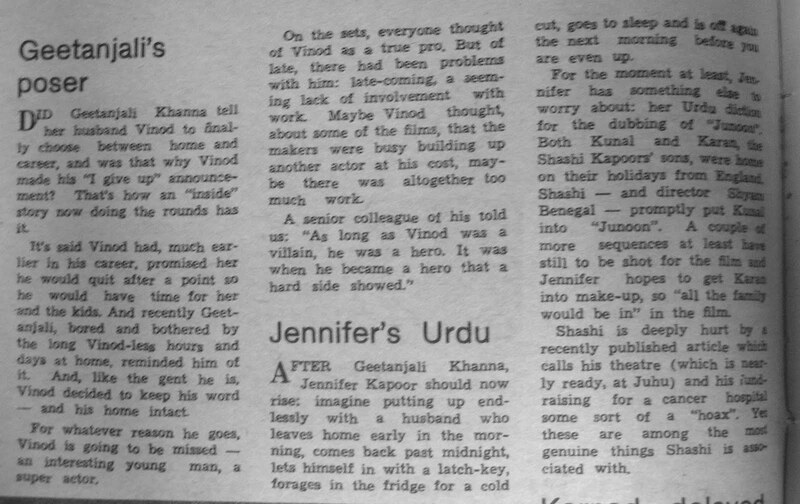 And because I had promised to post this ages ago, here is the regular feature "Tispy Queries" with Rekha (by Gurmeet Singh, December 4, 1970)! How cute is she? 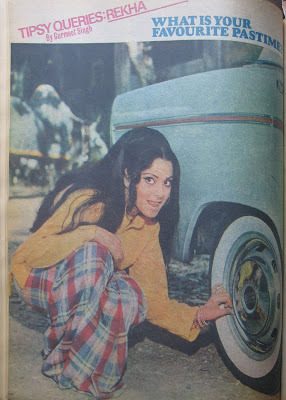 Aw, I want to go let air out of tires with Rekha. 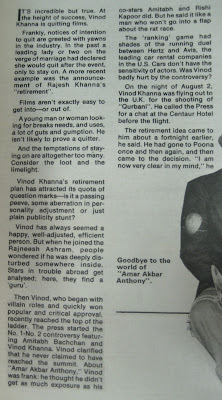 The Vinod Khanna article was a fascinating read. 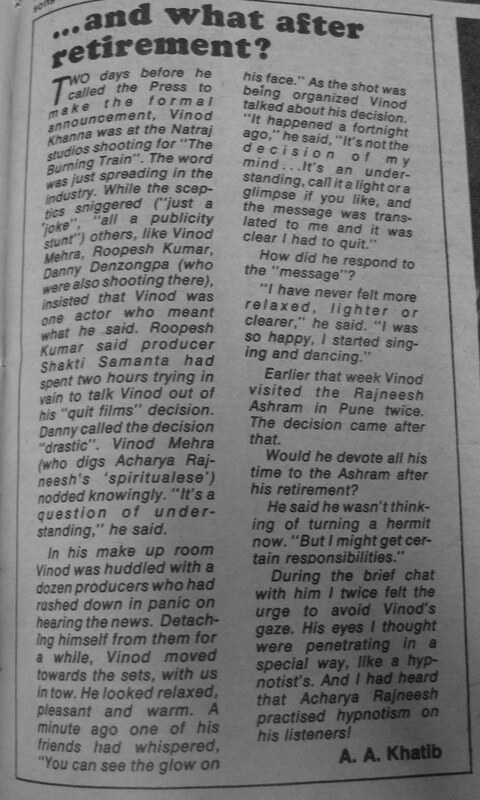 I remember all of the news when the Bhagwan Shree Rajneesh was in Oregon (and seeing followers in the airport), and then I lived in that part of Oregon, so I'm always curious about that stuff. Thank you for posting these- love em every time you post any. LOVE that pic with the Khanna boys! 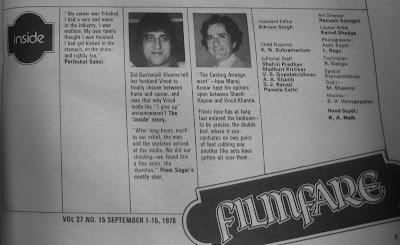 they still look the same- kinda :D This is the 2nd time today I've heard about Neetu's Atish, and I am hungering for it now. 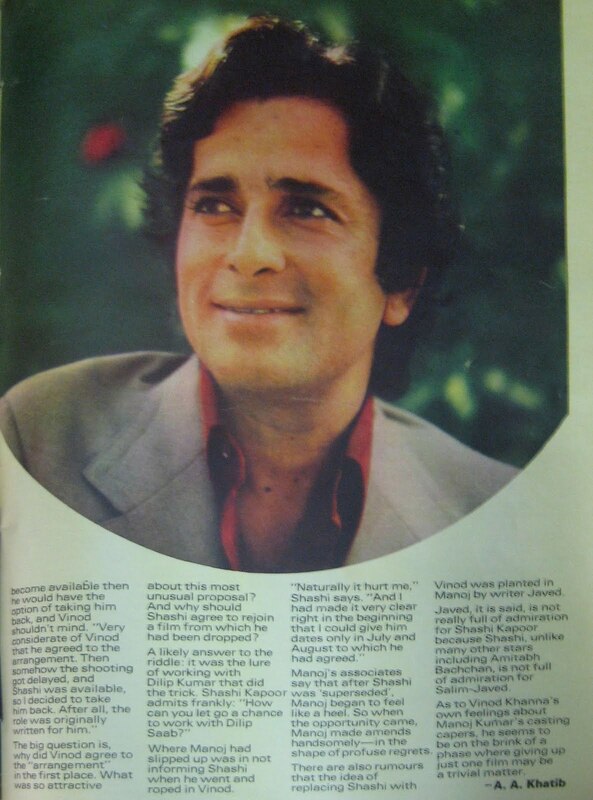 Vintage Shashi is something we need more of in the world. Thank you Beth for understanding and loving his awesomeness! I love your blog! !